DCI through iTunes ... for free! 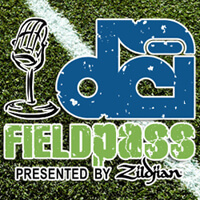 Drum Corps International's popular Field Pass podcast with award-winning host Dan Potter, brings drum corps fans the latest news and exclusive interviews direct from the 2008 DCI Summer Tour! Featuring new epsidoes uploaded daily, Field Pass gives you an inside look at all things drum corps from the parking lot, to the tunnel to the 50-yard line! And if you're a fan who wants to take Field Pass with you on an iPod, or have it delivered automatically to your computer through iTunes, you're in luck! The following tutorial will explain how to subscribe to the podcast through iTunes. 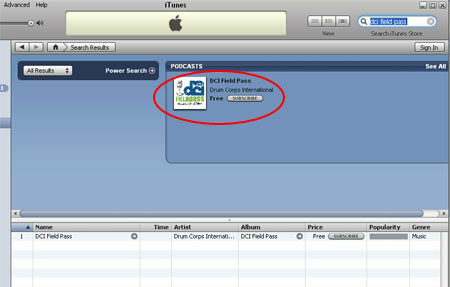 To subscribe to Field Pass, make sure you have iTunes installed. If you don't have it, you can download it for free through Apple.com. 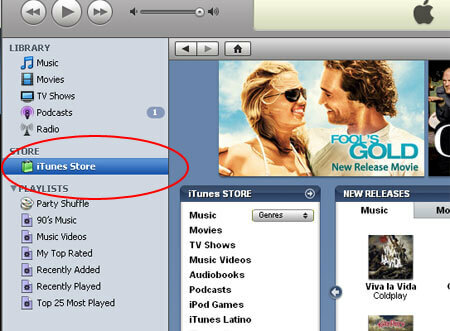 Start up iTunes, and click on the green "iTunes Store" category in the left hand navigation column. This will load the iTunes Store in the main window. 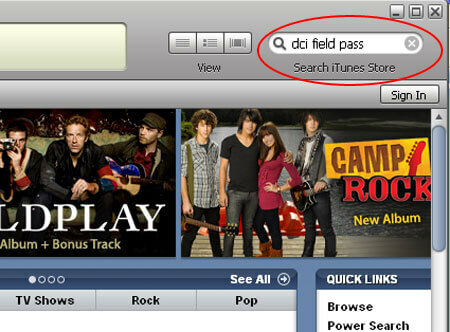 Next, use the search box in the upper-right to search for "DCI Field Pass" and hit the enter key. A page specifically for Field Pass should appear, and then you can click "Subscribe" to download the podcast. Alternatively, you can subscribe to Field Pass through DCI.org. On the DCI.org homepage for any Field Pass news item, look below the body of the article to find the orange link reading "Subscribe to this podcast through iTunes." After clicking, you should see your iTunes program start up. Find the gray button near the top that reads "Subscribe" and click to start getting Field Pass! Once you're subscribed to Field Pass, future podcasts will download automatically on to your computer when iTunes is active and your computer is connected to the Internet. Podcasts can also be automatically synced to your iPod. 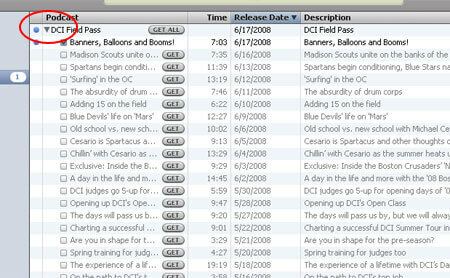 Find your downloaded Field Pass episodes in iTunes under the purple "Podcasts" icon underneath the "Library" heading. If you want to download past editions of Field Pass, click on the gray arrow to expand a list of all previous Field Pass podcasts. Click the "GET" button for the ones you want to download. If you have additional trouble with iTunes while trying to subscribe to Field Pass, consult Apple's online support site at Apple.com. Happy listening!